I know not many people read this blog of mine, however if you ever happen to pass by. Please take some time to read this post. 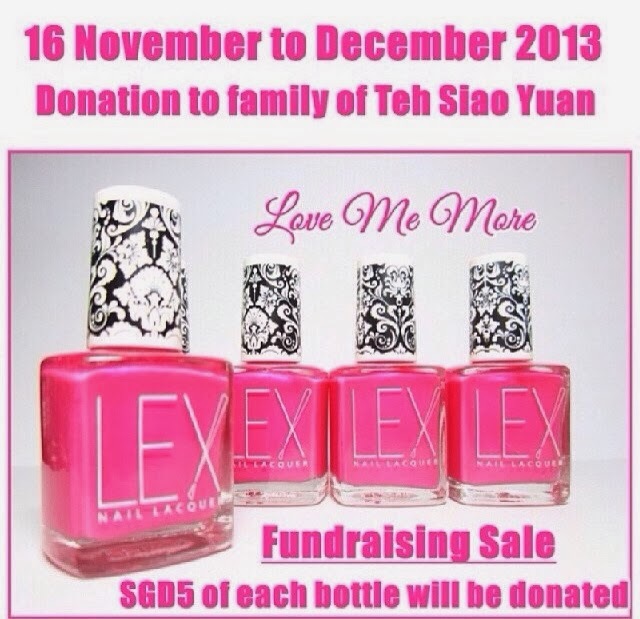 Recently, Meimeisignatures is selling Love Me More polish to raise funds for her niece's liver transplant surgery. Love Me More polish has been around for quite some time as it's a charity polish for general donation created by Lex Cosmetics. Mei Mei from Meimeisignatures has asked Lex Cosmetics to create a signature pink shade with a lovely name for her store for charity purpose. Love Me More is a pretty carnation pink with blue and pink micro shimmer as seen in the picture below. This polish is to raise funds for her 2 year old niece who will require a liver transplant surgery. This little girl, Siao Yuan, has been battling with this liver malfunction from the tender age of just being 2 months old! Isn't it just saddening to have such a condition at such a young age? She still have many years she has yet to experience. I hope that you would show your support and purchase Love Me More polish from Meimeisignature's store. It cost SGD 13, with each bottle purchased, SGD $5 will be donated to her niece parents to help them with their financial burden for the liver transplant surgery. Please note that Meimeisignature ships internationally, so for those who do not stay in Singapore, you can show your support too! This fund raising will commence from today, 16 November 2013 till 31 December 2013. Please show your support and purchase this polish from here to help her family during this time of difficulty! I will be showing her my support and purchasing this polish from her. Swatches will be up when I received this pretty pink polish from her. I hope you show your support too! You can go to her Instagram or Facebook account if you would like to know more details! Alternatively, you also contact her at her email. Thanks in advance to those who will be purchasing this polish!